This card is in honor of the former Yankees pitcher, who is still pursuing a career as a baseball player — just not in the U.S. News broke last week of a return to Japanese baseball for Hideki Irabu came as a surprise to me, and probably most Yankees fans who had to bare through each of his 64 starts in pinstripes from 1997-99. Irabu apparently was impressing scouts in the Golden Baseball League and has signed a deal with the Kochi Fighting Dogs of a Japanese independent league. 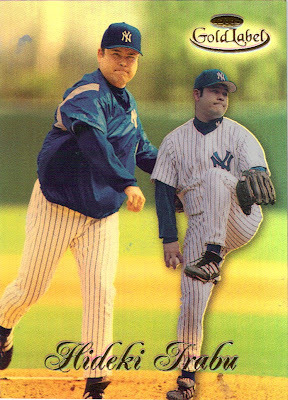 On a personal note, I was “fortunate” enough to attend one of his starts for the Yanks at Yankee Stadium. Even though I was a little boy, I somehow enjoyed watching him pitch. An inning that he allows five runs but also strikes out the side is the memory I have of him. He was just a weird guy that had no consistency whatsoever.